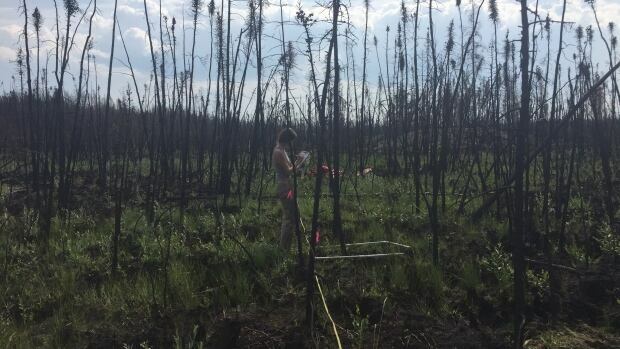 Ellen Whitman identifying post-fire understory vegetation in Northern Alberta for her PhD at the University of Alberta. Exciting to hear Ellen Whitman, MES 2013, on CBC Radio 1’s Quirks &Quarks this past weekend, talking with Bob McDonald about her summer field season on post-fire impacts in the north. She did a great job, and touched briefly on her work with Eric Rapaport and I on her Masters working on fire at the peri-urban fringe of Halifax. She is now working on her PhD in Mike Flannigan’s lab at the University of Alberta, looking at fire regimes and adaptation under short-interval fires, combining field observation and remote sensing. Exciting to hear about her progress, and rather awe-inspiring to hear her expertise, so eloquently and smoothly delivered during the 15-minute segment.